"It's a Frankenstein story and I play the dreaded doctor and I make a mate for the monster and its actually the sequel to 'The Bride of Frankenstein', it's not a remake, it's what happens after. It's done in the style more of Mary Shelley's original novel than the Hollywood legend. It's not a horror film, it's a kind of fairy story where I become a monster. I make monsters for a living and I end up as a monster. It's also a 'Pygmalion' story - I've invented this girl who I then teach how to behave in society. And it's a love story. I liked the part because I think it's a fascinating character. He's very clever but he can go one of two ways - he could either be very good and be useful for mankind or he could do it harm if he makes the wrong choices. And he makes all the wrong choices." "Not a great movie but I thought I was quite good. I had to act a lot. A lot of things went wrong with that film. It was camp because it took itself too seriously. The problem was I was the most experienced actor in the cast, and normally I work with experienced actors who bolster you up with their buoyancy. It was hard." 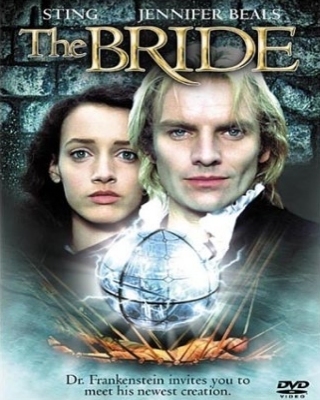 Sting makes his debut as a leading man on the silver screen when he portrays Baron Charles Frankenstein in Franc Roddam's 'The Bride' (1985). A psychological/feminist revision of 'The Bride of Frankenstein' (1935) Roddam's film puts a modern slant on Mary Shelley's classic nineteenth century tale, injecting elements from both 'Pygmalion' and 'Beauty and the Beast'. Paired with Sting as Frankenstein's female creation, Eva, is Jennifer Beals who had just recently been catapulted to stardom by the surprise 1984 hit 'Flashdance'. In his castle laboratory, Frankenstein brings Eva to life in a tumultuous opening scene of appropriate gothic proportions.Assuming that the raven haired damsel was created to be his bride, Frankenstein's monster (Clancy Brown) is understandably disappointed when he learns that Eva is in fact the object of desire of the Baron, and responds by destroying the lab, a scene which when filmed resulted in a seven stitch wound to Frankensting's noggin. Dr Frankenstein proclaims that he wants to shape the pristine mind of Eva into the 'new woman', a person of free thought and equal standing to men. However, when Eva becomes sufficiently buoyed by her new found freedom and begins challenging the repressive control under which Frankenstein keeps her, the Baron devolves into just another male chauvinist pig, exhibiting the kind of obsessive evil that so intrigues Sting, the actor. Sting's real life hero, Quentin Crisp, plays his assistant Dr Zalhus in the film, and David Rappaport steals many scenes as Renaldo, the dwarf who befriends, empowers and humanises Frankenstein's monster, ultimately preparing him for a climactic scene that pits the evil Doctor against his two creations. We don't want to give away the ending, but let's just say that "we never saw no miracle of science that didn't go from a blessing to a curse".